Since seafood is so healthy for us, and a favorite of many, it’s only natural that we would want to BBQ it. It’s a great choice for entertaining, since it’s so quick to cook. 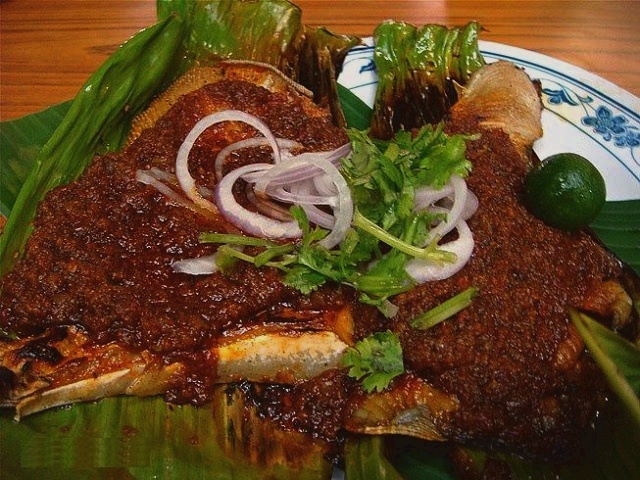 Popular dishes include stingray (cooked in a banana leaf), prawns and shellfish (stir-fried) in chilli sauce. Rub stingray with lemon juice and salt, set aside for 10 mins. In a small bowl, using your fingers, mix tamarind paste with warm water, strain, discard seeds, set aside. Heat wok on high, add oil, stir-fry ground paste till quite toasted, 3-5 mins. Remove from heat, allow sauce to cool. Soften banana leaf in hot water, dry well with a tea towel, lightly coat with vegetable oil. Fold the banana leaf into a packet, secure with toothpicks. Grill on a hot charcoal bbq grill or indoor grill or stovetop grill pan, 10-15 mins, depending on the thickness of the fish, turn over once. Garnish with sliced onions, coriander leaves and lime wedges. Serve hot with steamed rice or a fresh salad.